One moment has faded with time so I can’t connect it with a specific date — there was a day when Mr Grigorescu was so generous as to take me with him to one of his collectors: a huge house in the suburbs of Bucharest with an automatic gate and lots of still lifes on the representative ground floor and a lot of Teodor Graurs, Tzaras, Brâncușis and 3 Grigorescus in the attic. I couldn`t really understand the vast diversity of styles and quality of those works – ranging from one of the biggest collection of Romanian historical maps through African sculptures as well as intimidating overcolored sculptures between two suitcases that once belonged to Brancusi. Including what was in there. I asked the collector on how he came to the idea of collecting Grigorescu as it didn`t seem to me, that contemporary performance or conceptual tendencies were his focus. He replied that he saw his name in the Pompidou noticing his Romanian origin and back in Bucharest asked for a meeting with Grigorescu. The collectors background was business and he told me that his friends and colleagues thought he was insane when he was showing them the attic – so he decided not to show it anymore to visitors – probably that’s why he was visibly surprised that I was recognizing some of the works…When I was alone for a moment in the room a ca. 7 year old boy turned up and asked me (in good English) that he heard I was an art historian – and what this was. I tried to answer but then alreday the next shot came: whether I would write about the world wars. I said not directly – and when I saw, he was disappointed I replied that I still feel the courage in me to try to answer his questions, so we were talking about the influence of war on art – but suddenly the adults came in and the boy disappeard. Grigorescu was born on the 8th May 1945. On our way back to Mr Grigorescu we stopped by his brother’s house — a 19th century villa where the three Grigorescu brothers spent their childhood, in its staircase a fresco by Ion Grigorescu’s brother, Octav, and another fresco from a 19th century villa from a demolished house in the vicinity where the former House of the People was erected — the last remnant of the earthquake not in 1977 but which destroyed Bucharest even more — Ceaucesu’s quest for power. 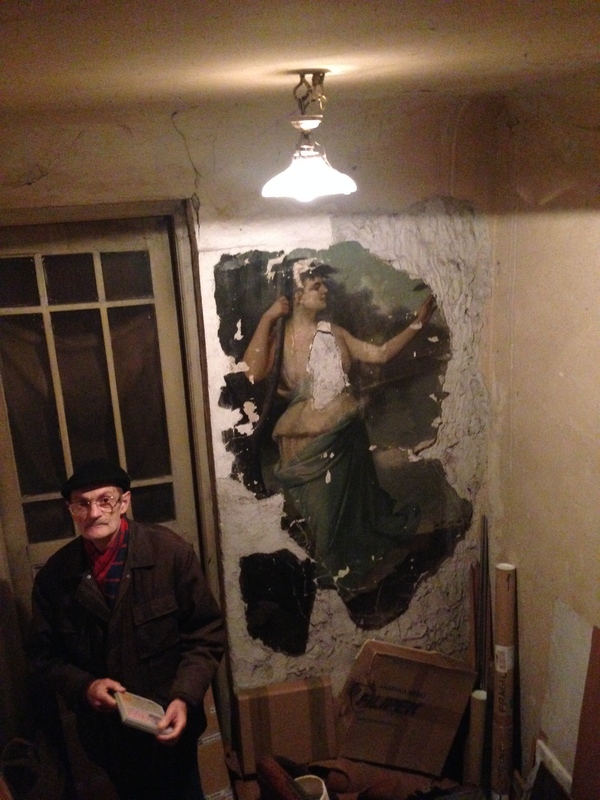 It is this house where Ion Griogrescu’s works and catalogues are stored in an attic with spare light and narrow steps. To tidy up here is one of his duties for a later time. And to finish the restoration of the church in his street — and to take care of the house of his mother-in-law in Câmpulung and of that of his parents in Bengeşti. There are two bas-reliefs in that house as well — made by him and by his youngest son Emil, depicting their ancestors. It is the family, the family you have to take care of, which is reality. And it is true — it is superior to art, but for me neither of them can exist without the other. So I went back home to my children and husband a few days later — arriving as if from the front: my life has changed but I can’t talk about it.